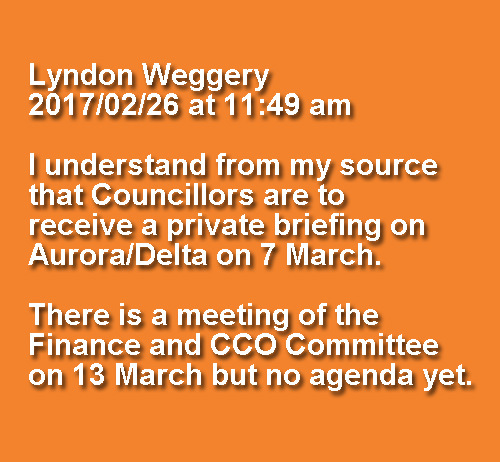 DCC councillors to receive a ‘private’ briefing on the state of Aurora/Delta on March 7th . . .
My crystal ball has just shattered, because reality in City Hall on that day will finally be realised. This will be a brief meeting, basically to lay out the crippling cost of restoring the Aurora network to a condition which is anywhere near safe and reliable. There are only 6 words to be said. The meeting may possibly present some options to consider, but none will be good news for the city, nor for the regions of Otago within Aurora’s network. With the closing of Cadbury, the entire workforce there can be redeployed, no longer making chocolate, but soup. Dunedin ratepayers will soon be needing one very large soup kitchen. New bus hub close by. Cycle lanes leading to and fro. A nearby stadium to huddle together in, when the winter power blackouts begin. (Season’s pass still required though, payable to ORFU). I apologise for making light of such an appalling situation. However Aurora on its own will soon be incapable of making light at all. Best wishes Dunedin. I still love the people, the place and visit regularly. Nick, you put it so boldly eloquently. To me, 7 March sounds like a cap in hand ASK for more ratepayer money. I wouldn’t expect anything less from that bunch of coconuts, strung by the vastly unsavoury Crombie and Thompson. Watch the elected Council accede to demands with an imaginary open chequebook – since they are bloody clueless and lack Spine. God forbid the day they know what one billion dollars looks like. No pretty way to put that. 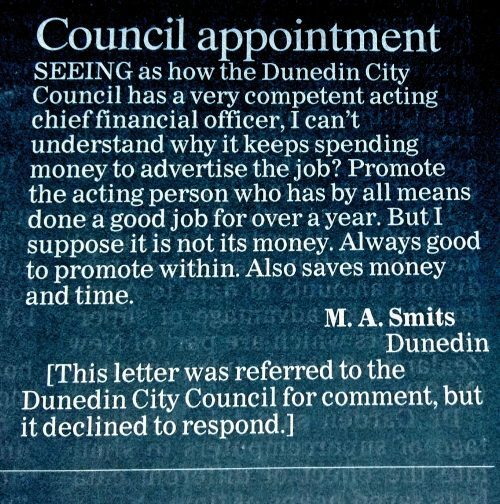 The sad thing is that there are so many intelligent and fair-minded people in Dunedin who could contribute hugely to civic affairs, but have no wish to become embroiled in the mire of thinly disguised self-interest and incompetence that has become the hallmark of City Hall. It is not hard to see who has been exerting the influence over Council in the last decade. Perhaps our University could give the city a steer. An MBA course in civic management? The bright young commerce heads are quick to prune the decaying crap out of any enterprise that has potential, yet is languishing. Case studies on all of DCHL’s group of companies. Any MA undergrad could script a few useful words for Cull to pronounce at times when something of substance needs to be spoken publicly. Help the man – he sure needs it. Dunedin has the Brains Trust within, and, apart from putting on a few extra rubbish collections around the student quarter, largely ignores their potential. It’s a curious sort of symbiosis. Feed them, sell them booze, clean up after them, rent them streets full of hovels, ignore their talents and wave them goodbye at the year’s end. 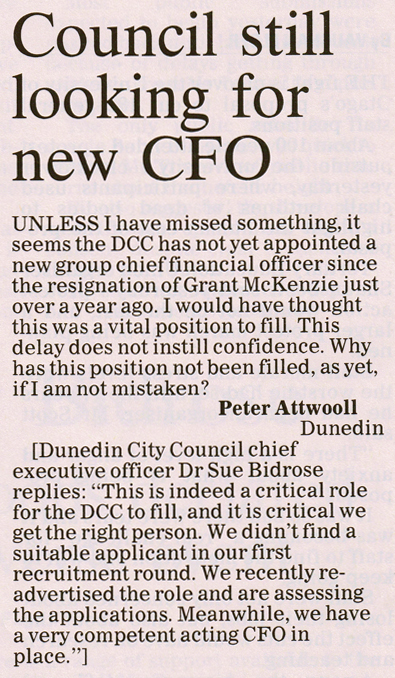 Or perhaps, DCC should just employ ANY Dunedin Primary School Board of Trustees to oversee and guide their governance. They all know how to operate within a fixed budget, successfully employ capable staff, face any ongoing problems head-on and deal to them punctually, maintain their assets, and produce worthwhile results within fairly stringent national standards. And BoTs are all volunteers!! We can tie ourselves into some stupidly rigid patterns of local government that have bloated appetites for ratepayers’ cash, and fail to address the obvious shortcomings of the system that is now serving Dunedin so poorly. And we continually accept abysmal results!! If A/D is serious about separation, it needs to cast off Delta. Sell it. There are enough competent, well managed independent lines network contractors in the South Island to do Aurora’s work, and the Delta linesmen would all be so much better off working for them. Delta already employs these contractors!! Take a quick look at how Network Waitaki operates. Notice anything?? I’m rambling. Time to feed the dog. This will be an interesting meeting but only if the Councillors don’t sit back and just accept a briefing. From a selfish point of view, I care most about the essential electrical infrastructure throughout Central Otago. We here rely on Aurora and Delta to provide and maintain an essential infrastructure, but at the same time we seem to be entirely at the mercy of both these companies, DCHL and the DCC to spend the necessary money to do just that, but at the same time knowing that all the necessary cash is going to support another series of DCC activities. I have no idea of what sort of pressure can, or should be, applied to the DCC by CODC and QLDC, but I sense that the most pressure that will be applied on this meeting with the DCC Councillors will be how to mitigate the huge costs faced by Aurora/Delta and the subsequent loss of revenue. I don’t think that there will be any real thought given to the other areas who rely on the network. The big thoughts will be on the effects on the budgets in Dunedin. We received your request on 27-January-2017. We will endeavour to respond to your request as soon as possible and in any event no later than 27-February-2017, being 20 working days after the day your request was received. I can report that no response was received by 27 February as lawfully required (Local Government Official Information and Meetings Act 1987). No notice of extension was received within the 20 working days. I have thus alerted DCC strategy and governance general manager Sandy Graham by email. Cc staff officers. Methinks it’s a matter of the left hand not knowing what the right hand is doing. Delta can’t keep itself out of trouble by poking its nose into fields unbeknown to it, while Aurora seems to be besotted by rugby and the urgings of the Mayor and his needs for more money. The result is what we see, a run down, shelves empty outfit with enormous capital requirements, no money and very little in the way of high priced competence on board. Not a good position to be in. How well our Mayor will handle this is fairly obvious, whilst senior councillor David Benson-Pope explains what the inner city ought to look like in the opinion pages of the ODT. Enough to make one move on. Tue, 28 Feb 2017 at 11:33 a.m.
You will be pleased to know my Council source was spot on!!! The bad news is that details of what Crombie will say (particularly on Aurora/Delta) will not be released to the public. 1. When will the DCC appoint a Group Chief Financial Officer (GCFO) to replace Grant McKenzie ? 2. For what reason(s) has this appointment been delayed ? 3. Have applicants for the position been short-listed ? 4. Is there anything thing else DCC wants to say about the appointment process? 1) An appointment date has not been decided. 2) A suitable candidate for the role has not been identified. 4) The DCC does not wish to make any further comment. You have the right to seek an investigation and review by the Ombudsman about the delay in responding to your request. Information about how to make a complaint is available at http://www.ombudsman.parliament.nz or freephone 0800 802 602. Sent: Tuesday, 28 February 2017 2:15 a.m.
No response was received from council officers by 27 February as they indicate below by email (my red highlighting). I’m unsure why this is the case, if there is as you say a staff system set up to make response within 20 working days – I note the Ombudsman has recently been critical about the 20 working days being treated by information providers as “target dates”. I have received no notification of an extension. Nor have I received a phone call from the Chief Executive as alluded to by postscript below – although the latter is of much less concern and I appreciate there is likely to be good reason for this. This is very strange. A shortlist has been made, but there is no suitable candidate to select from that shortlist. Am I missing something here? The long time to appoint a new GCFO is not a good look for the council, nor does it inspire confidence. Is it possible the shortlisted candidates are not suitable, but are a fallback/default position for the council? Why hasn’t someone suitable applied? Have the best possible applicants done their homework and decided applying and taking on the job would not be a good career move when they move on to something better? Grant McKenzie was there for a very short time and he probably had good reason to be. Any GCFO will inevitably take the flak if the council they are working for is financially illiterate. Who would want the stress or have their career killed by taking on the job? Not sure if the acting GCFO has applied for the job. I gather not. As Sue Bidrose has said, in response to my letter on the same subject, that no one suitable has been found from a previous round of applicants. Yet she says the acting GCFO is competently doing a good job. Thus why l don’t think he has applied.